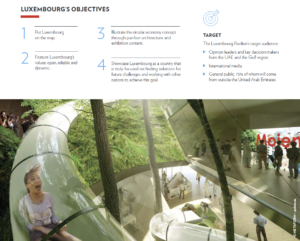 The Luxembourg Pavilion will offer excellent sponsorship opportunities. A sponsorship program has been developed based on 3 formulas but a customization is possible as well. If you want to learn more about those opportunities click here and if you want to discuss your ideas for engagement do not hesitate getting in touch with our team connect@luxembourgexpo2020dubai.lu.